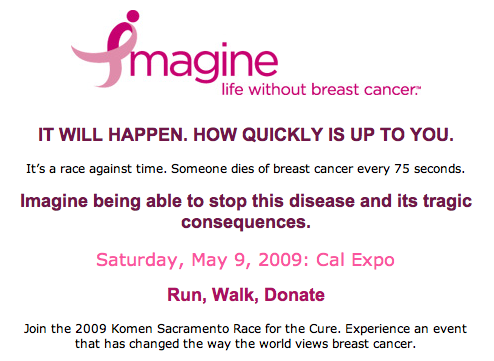 purekatherine: Race for the Cure! This took me longer than I'd like, but here is the information, I hope there are lots of you who can come participate! My sister-in-law and I are hoping to get a team together. Most of that team seems interested in walking at this point, though I have to admit that I'd like to see if I can't run for at least one of the three miles. It is a 5K, which is about 3.1 miles, and the time I participated before it was a bit of a celebration the whole way. It's rather early in the morning, the parking lot opens at 6:00AM and the race starts about 8:05AM, but what a reason to get up, right? There is online registration, but I guess Sandy and I should start a team before telling everyone exactly how to register. The deadline for online team registration is April 24th, so Sandy and I will take care of that tonight and I will update about it again.